◎ The CCDI’s latest opinion document further verifies our earlier analysis that Xi’s “sweeping black” campaign aims at solving multiple problems in one swoop. In a recent opinion document, the Central Commission for Discipline Inspection (CCDI) emphasized to the various discipline inspection organs the direction and intent of Xi Jinping’s new “sweeping black” anti-organized crime campaign. 3) Are not doing their best in “sweeping black” work. Jan. 24: The 19th CCP Central Committee and the State Council issued a document on a new “sweeping black” campaign against local mafia and other criminal elements. 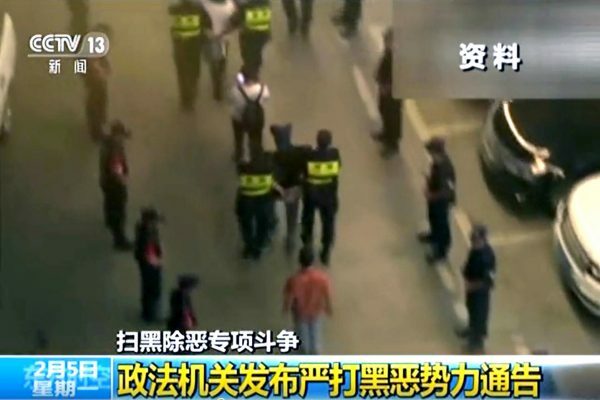 Jan. 30: Xinhua publishes an article on the punishing of 29 Guangdong Public Security Bureau officials for being “protective umbrellas” to local mafia. 1. The CCDI’s latest opinion document further verifies our earlier analysis that Xi’s “sweeping black” campaign aims at solving multiple problems at one go, and is targeted primarily at corrupt officials in the domestic security and legal apparatus and the grassroots. 2. The various provincial security authorities rounded up at least 6,000 criminals within 20 days after the campaign was announced, according to news reports. However, reporting on the arrest of “protective umbrellas” has been sparse. The above phenomenon suggests that local security authorities are adhering to the usual protocol of similar Party campaigns, i.e., make some arrests first to answer to the demands of higher-ups, but avoiding the real enablers of criminal activity. We earlier noted that the CCP’s authoritarian system would inevitably result in “mission creep” during the implementation of campaigns and lead to the arrest of human rights activists, for instance. Businesses in China should be aware that officials can take creative license in interpreting Xi’s “sweeping black” drive and abuse it for their benefit. 3. The Xi administration is very aware that the anti-organized crime campaign may go out of hand or lose its intended focus. Hence Party central has to issue documents continually or run articles in state newspapers to send political signals to local governments who might be trying to get out of arresting their corrupt fellows.